One of the most idyllic spots in Connecticut to have an outdoor wedding. The backdrop of the water, the rocks, and sunset make for gorgeous photos. The food was masterfully presented and deliciously prepared. The service was outstanding and the personnel were as helpful and courteous as could be. 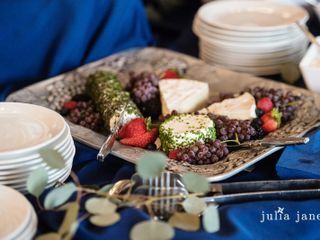 The catering director, Libby Rutty, saw to it that every detail was perfect and exactly what my son and daughter in law had dreamed of. The rooms were beautifully decorated and very spacious with lovely views and a fireplace. This is a 10 star venue!! Libby, Nicole and the team were amazing. We had an amazing wedding at the Madison Beach Hotel! From the planning to the reception, Libby, Nicole and Megan were so helpful and fun to work with. The venue has amazing views, beautiful accommodations and delicious menu. We couldn’t have been happier celebrating our marriage at the Madison Beach Hotel. They mead us, our family and guests few so special. Happy to have them part of our memories. Wow! Madison Beach Hotel went ABOVE AND BEYOND for our recent wedding! Beautiful oceanside venue with an amazing team! I can't say enough great things about Libby, Nicole, Megan and everyone else at Madison Beach Hotel! Our wedding day there was a dream come true and the amazing team at Madison Beach Hotel made wedding planning a breeze. Libby and her team are extremely responsive, and were so accommodating! They are true wedding professionals! The food was AMAZING, and the views of the water were breathtaking. We can not thank Madison Beach Hotel enough for everything they did to make our day absolutely perfect . We can't wait to go back and visit! When you walk into Madison Beach Hotel- you know the setting is idyllic. Gorgeous boutique hotel, with nice looking restaurant and a porch with a million dollar view, made even better by the beautiful rocks you can go and climb on yourself (hello- wedding photos!) but for an incredible day to come together with ease and class- it takes a team of people- where everyone is passionate, and their leader is organized, personable, and professional. After having my wedding in September, I can confirm the MBH team is INCREDIBLE, and it is led by the one-of-a-kind Libby Rutty. 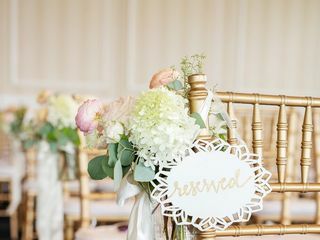 Aside from the gorgeous setting, we were worried about the dreaded- "wedding factory" feel that often comes with places that throw at least a decent amount of weddings every season. I can honestly say- I don't know how Libby does it. She made me feel like I was the only bride in the world, not just that day but that season!. From the time you are picking your date, to the time you lay your head on your pillow that night, Libby and her team are attentive, knowledgeable, flexible, and genuinely excited to execute the day. No problem was too big, no question was annoying. I cannot say enough good things about Libby, and the team, including Nicole who was also so on-point, genuine, organized, and attentive that weekend. Not to mention the food- our guests are still talking about appetizers and their dinners. You know how bride and grooms say they don't get to eat because they too busy? We sat down and ATE- loved the menu and my wedding dinner. My husband and I have incredible memories from that day- no stress- just two people surrounded by their friends and family, in a special spot, with some really professional and caring people making sure it all goes down as planned. And yes- we took pictures on the rocks :) Can't go wrong at MBH- rain or shine. Thank you Libby, Nicole, and the entire MBH team. I can’t say enough positive things about my experience with the Madison beach hotel! Nicole, Megan and Libby were all so amazing and helped me plan the perfect day! The food was absolutely INCREDIBLE and the views were breathtaking. You truly can’t go wrong with this venue! Thank you Madison Beach Hotel and thank you Nicole, Megan and Libby! Wow! The MBH went above and beyond. We were just married on 6-30-18 and everything was perfect. Libby is so detail-oriented and calm! She really helped us look at all angles while we were planning and helped us through every step along the way. Her "A" team was phenomenal. The entire MBH staff treated was friendly, accommodating and efficient! We felt like royalty. We paid for a bridal suite and were offered a HUGE room with breakfast and lunch service to get ready in - it was beautiful. 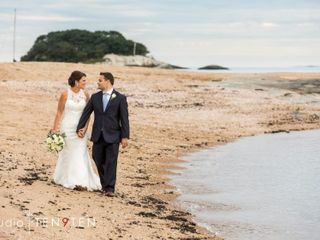 We couldn't be happier with how our day turned out and would highly recommend this venue to any couple looking for a picturesque, New England, beach wedding! 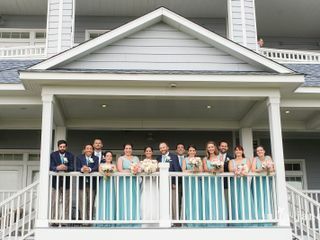 We got married at the Madison Beach Hotel on May 5 of this year - as an out of state bride, the staff here (Nicole and Libby especially) were extremely responsive, caring, and just wonderful people. The minute we entered the venue for the first time, everyone was smiling, welcoming and really just wanted to make sure we were comfortable and happy. 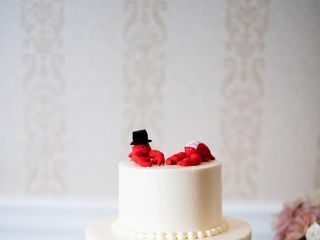 As an inter-racial couple, we wanted to incorporate different types of foods and traditions that they normally hadn't dealt with, but everyone on staff made sure we were able to have the wedding of our dreams. The actual wedding day was probably the least stressful day of our lives because the team there had it so under control that we could just relax and have an amazing time! The view from the ballroom and ceremony site are to die for, the food was insanely good, and all our guests raved about how amazing the hotel was. We can't recommend the Madison Beach Hotel enough as a venue - mostly because of the people. My husband and I got married in April 2018. While we got married off-site at a church a mile down the road, we had our reception at the Madison Beach Hotel. I can honestly say that our wedding was beautiful, seamless and nothing short of incredible. From the minute we first toured the venue with Libby, we knew it was for us. Libby and her staff were incredible throughout the planning process answering any and all questions we had, as well as offering advise stemming from years of invaluable experience! All of our guests continue to gush about how incredible the wedding was, from the food and drinks, to the stunning views, and the professionalism of the staff. It's very clear that Madison Beach Hotel takes pride in their hotel and their event planning. We worried about absolutely nothing and just go to enjoy our day, which exceeded our wildest wedding day dreams! We'd like to say a big thank you again to Libby, Nicole, Ines, and all the other people who truly made our day incredible. Thank you for your kind words. It is the greatest compliment to hear we have exceeded our couples expectations. You and Ryan were so wonderful to work with, you made our job easy. Fondly, Libby, Nicole and staff. Our daughter got married there this past weekend and the venue was everything we expected and much more. The personalized service, attention to details was wonderful and our guests loved the venue and hotel. Libby and Nicole were great to work with and their staff were extremely attentive. We got so many compliments from the food to the high level of quality for the entire wedding experience. My husband and I hosted our reception at the Madison Beach Hotel on September 29th, 2017 and we could not have been happier with Libby, Nicole, Meghan, and the entire MBH team. Our guests keep raving that our wedding was by far the best they have ever attended. The facility itself is breathtaking - newly renovated in 2013 right on the water - it is the perfect mix of beach wedding meets formal elegance. I started pestering Libby early with questions about everything from timelines to food restrictions to unique decor accommodations, and Libby patiently and expertly addressed all of my concerns. We hosted our cocktail hour in tides so that guests could view us taking photos from the open porch (which everyone loved) - and the raw bar was a huge hit! The food in general was extraordinary - gracious portions that were expertly prepared by chef. Not only did Nicole, the banquet manager, keep us on schedule, but we had our own server dedicated to keeping my husband and I fed, watered, and happy throughout the entire night. The staff went above and beyond to make sure that our wedding was perfect, and we couldn't give the hotel a higher recommendation. A note to anyone looking to book this venue - the rooms are a little pricey, but trust me, they are worth every penny. Our guests that spent the night at the hotel raved that the rooms were absolutely outstanding - so don't let your guests miss out!! I planned my wedding in 6 months with Libby and she was fantastic! The hotel staff was very accommodating with my every need. Nicole, who was head of catering was by my side for the ceremony and she made me feel so special. The food was delicious. My guests called me or texted me the next day to tell me what a great place and time they had. I can't say enough great things about Libby, her entire team, and the Madison Beach Hotel. I have never met anyone with more passion or a bigger heart than Libby and her team. We were constantly treated with such respect and kindness, and they made an experience that can be stressful, a breeze for us. The day of the reception was a dream come true. Nicole made sure that everything was set up for us, so that all we had to do was enjoy our day. The whole experience was worth every penny. If you're looking for the experience of a lifetime and the wedding of your dreams - stop looking. The Madison Beach Hotel is the one. We recently celebrated my daughter's wedding in June of 2017 at the Madison Beach Hotel. The Madison Beach Hotel is an absolutely beautiful venue. Our wedding day was perfect from start to finish. The staff at Madison Beach Hotel did not miss a beat. From the very first time we visited and through the entire planning process, they were awesome. I would highly recommend the Madison Beach Hotel. I can't say enough great things about this venue. It's the perfect setting for a beach front wedding! Everything about The Madison Beach Hotel is immaculate from the venue itself to the staff, and the food was out of this world too! Nothing is missed here. The staff is exceptional and helped to accommodate all of our needs no matter how last minute they were. Libby is the best and she'll make sure your day is perfect! We now can't wait to go back to visit. My husband and I just got married at the Madison Beach Hotel on 12/3/16 and we could not be happier! Everything about this place is amazing- the staff, the rooms, the food, the views, just everything. They did a beautiful job with the wedding (thank you, Libby, Megan and Nicole!!!) down to every detail, and our guests were all very impressed with the hotel as well. I just cannot say enough good things about this place- we will definitely be coming back to stay in the future, and we highly recommend the Madison Beach Hotel to anyone getting married!!!! If you want an intimate wedding (we had roughly 140 guests, which I understand is a big wedding for MBH) with beautiful views, excellent food, and wedding coordinators who genuinely care and absolutely know what they are doing, you just cannot go wrong. Libby and Megan helped me every step of the way with the planning process, and I had absolutely no worries at all on the wedding day! Libby was there for me on the wedding day, checking in and making sure we had everything we needed, and after taking our first look photos out on the beach for an hour (it was very cold and windy, but we braved it for the beautiful sunset! ), she brought me a blanket and a hot toddy to help me warm up before the ceremony. Nicole was also there for us, coordinating everything from the rehearsal the night before, to our ceremony and reception on the big day. Nicole is absolutely amazing; she made sure that everything we had planned actually happened, and when we needed reminding to go cut the cake, etc. she was there to remind us in a completely non-stressful way! If it were not for Libby and Nicole, I can't even imagine how everything would have turned out, and I realize that they did things behind the scenes that I'm probably still unaware of in order to make everything run as smoothly as it did. All in all, hands down, my wedding day was the best day of my life- thank you to everyone at the MBH for making our big day so unforgettable! If you want to have a special wedding, Madison Beach Hotel is the place to do so! We just had our wedding there on October 15, 2016 and we did have our perfect wedding, we call it our "Best Day Ever" and we owe so much to the hotel and their amazing staff. It will be a day we will never forget. Working with Libby, Nicole and the rest of the staff was a joy, they made every little detail perfect, they made us feel so special, they made it personal for us and our guests said such wonderful things about them and the hotel. It was truly a blessing to have our wedding there. And now we cannot wait to celebrate our 1 year wedding anniversary there next October! Doreen and Nani. The staff was wonderful ,especially Libby and Nicole, who are 2 of the nicest most accommodating ladies you will meet. A mother can only hope that the choice for a venue will work...this beautiful spot far exceeded all my expectations! All you have to do is ask and they will make it work. From the moment I lifted my head off the pillow on 10/1/16 to the moment I laid it back down, I was in love with every aspect of my day. I was in love with the obvious, the man I married, but I was also in love with everything about Madison Beach Hotel. It has such an intimate wedding feel in an absolutely breathtaking and calming location. The food for me was one of the most important parts and also lucky for me the hotel prides themselves on their cuisine. It was not a wedding factory feel from the staff to the FOOD!!! It was amazing. Now onto why it was so amazing, Libby and Nicole. Libby spent the past 5 months holding my hand, understanding when the difficult moments came up with a dash of humor and confidence and seemed to know just what I wanted when I walked through her door and made it very clear that I was going for a not so traditional "vibe". From when we started the day to the end of the evening, everything was taken care of and I had zero worries. Libby made sure she saw me off down the aisle with water in her hand right at the steps before I walked down and Nicole who spent the reception with us and seemed to know our every move and only retrospectively did we realize this :) She was calm, 10-steps ahead and genuinely cared. Our room at the end of the evening was beautifully set up for us but she even remembered our brownie sundaes we never had a chance to eat :) , she thought of everything. I never once felt like I was just another bride to Libby and Nicole but also the entire staff of the hotel. You feel like you are staying at the Ritz, the service is impeccable. Moral of the story: BOOK THIS VENUE!!!! If you love the beach and want a wedding that has no worry, good food, amazing staff,insanely beautiful rooms, and doesn't feel like a wedding factory, then this is your place. We will be back for every anniversary. No regrets. We got married in August 2016 and just celebrated our one year anniversary back at the lovely Madison Beach Hotel. 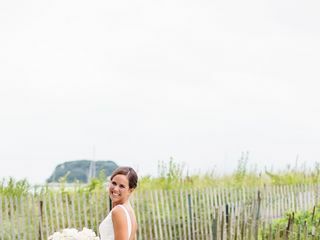 If you are looking for sheer picturesque New England beauty, elegance and a notable experience, on by leaps and bounds what is the best beachfront Connecticut location, there is no doubt that this is what you are looking for! It is a boutique property with 33 rooms so your day is just that… YOUR SPECIAL DAY! Your event is the only one taking place on your reserved date so the attention to detail is immeasurable as your event is their number one and only priority. 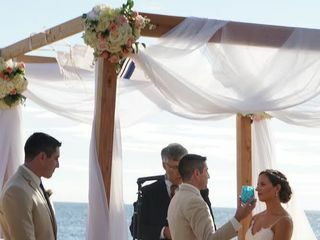 We were able to create our very own unique style to create a magical, colorful ceremony on the beachfront as well as a gorgeous reception to follow, to include white leather couches on the second floor balcony overlooking Long Island Sound which was a guest favorite! Our guests are still raving about how stellar their experience was. The photographer's pictures taken at sunset are truly remarkable and make for memories that truly last a lifetime. We had canvases made of some of these beautiful backdrops that look like something out of a magazine. The food selections… to include the passed hors d'oeuvres, the clam chowder/lobster bisque station (my favorite! ), the meal selections, to the dessert table were all very impressive. We can't say enough about how happy we were to have chosen the Madison Beach Hotel. Pay it a visit and you will undoubtedly make the same wonderful decision we did!! We had the most perfect wedding at the Madison Beach Hotel in July! Libby was absolutely amazing throughout the whole process. She was able and willing to help us plan and coordinate every little detail to make sure we had our dream wedding. Guests continue to rave about the food, the setting, the staff, and the location. We can't thank you enough for making this a day we'll never forget! My husband and I got married at Madison Beach Hotel in July 2016. We had our ceremony and reception both at this venue. So far, it was the best day of our lives!! Libby and her staff were so professional and friendly, and catered to our every need that day. I felt that Libby really got to know us as a couple during the wedding planning process and therefore, the day was comfortable and seamless. The food was excellent and they set up the room exactly how we had imagined (especially with all our tupperware of decor). I can't praise the Madison Beach Hotel and their staff enough. It is worth it!